At times you may be faced with the complex task of firing a church employee; this download will provide you with guidance to properly navigate the dismissal process. Learn how proper hiring procedures can make the unpleasant job of firing go smoothly. This download presents common firing mistakes to avoid, action steps you can take to protect your church from legal backfire and what to do when you have to dismiss a volunteer church worker. 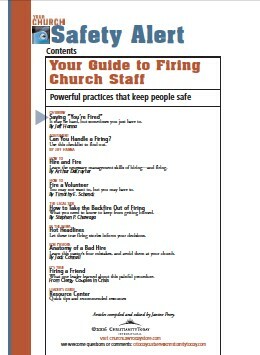 Also, read lessons a pastor learned from their personal account of having to fire an employee. It may be hard, but sometimes you just have to. Learn the necessary management skills of hiring—and firing. You may not want to, but you may have to. What you need to know to keep from getting burned. Let these true firing stories help inform your decisions. Learn this pastor’s four mistakes, and avoid them at your church. What one leader learned about this painful procedure.